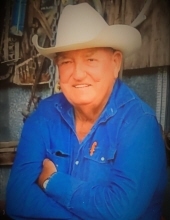 Celebrating the life of James Ray Grissett, Sr.
Obituary for James Ray Grissett, Sr.
Funeral services for James Grissett, age 83, of Buffalo, will be held 2:30 P.M., Monday, April 1, 2019 at Bethel Baptist Church in Buffalo, Texas. Pastors Tuffy Loftin and Terry Skinner will officiate the service. Interment will be in the Grissett Family Cemetery. The Grissett family will receive friends Sunday, March 31st at the Walters’ Buffalo Funeral Home from 6 P.M. to 8 P.M.
James Ray Grissett, Sr. was born September 24, 1935 in Oletha, Texas to parents, Thomas & Lillie (Burkeen) Grissett. He was a graduate of Centerville High School. Affectionately known as PawPaw by those who knew him, James was a devoted family man. He began his career with the Texas Highway Department in Conroe in 1953, working on IH-45 continuing through to the Navarro County line. He retired as an Inspector in Buffalo Area Engineer’s Office in 1986 after thirty-three years of service. After his retirement he continued to farm, ranch and produce rodeos across Texas, Oklahoma and Arkansas. He especially had an interest in bucking horses. PawPaw enjoyed working with his cow dogs and competed and placed in several cow dog trials. Being an avid horseman, in the early 1980’s he and several other Leon County men participated in the Salt Grass Trail Ride. PawPaw loved spending time with his family and watching his children and grandchildren ride and rope. When his children and grandchildren were involved in 4-H and FFA functions, they could always count on his knowledge of animals, support, and encouragement. Those that knew him, knew that he would give the shirt off of his back to help someone in need. He passed that legacy down to his children and grandchildren. James passed away March 29, 2019 surrounded by his dear family. He was preceded in death by both of his parents; wife of forty-seven years, Gloria Ann Grissett; brothers, Earl, Thomas & Jimmy Grissett and sisters, Christine Grissett, Stella (Grissett) Loyd, Mary Beth (Grissett) Drain and Ruby (Grissett) Lewis. He is survived by wife, Sharra (Ramos) Grissett; sons, James Ray Grissett, Jr. & wife, Pam, Lawrence Wayne Grissett & wife, Monica and Gerald Lee Grissett & wife, Ruthie; daughters, Nancy Cheryl Spivey and Janis Sue Trahan & husband, Steve; step-sons, Bradley Kelly & wife, Sarah, Jeffrey Ansley & wife, Onnia, Kurt Ansley & wife, Jennifer and J.T. Ansley & wife, Hali and step-daughter, Robin Dalal & husband, Shanky. James is also survived by grandchildren, Michael Grissett & wife, Melissa, Carl Grissett & wife, Kendra, Shannon Cornett & husband, Jason, Robin Dunn & husband, Eric, Sam Grissett, Mandie Tomplait & husband, Drek, Lindsey Spivey, Josh Spivey & wife, Cristin, Brooke Trahan, Erin Trahan, Kaila Bohannan & husband, Rhett, Emily Grissett, Allison Grissett, Alayna Grissett, Ely Ansley, Brook-Lyn Ansley, Kilynn Ansley, Wyatt Ansley, Tanner Ansley & Jensen Ansley; great grandchildren, Ellie Grissett, Dawson Grissett, Tomas Grissett, Trevor Grissett, Kenleigh Grissett, Landon Noey, Landrie Noey, Hunter Asnley, Taryn Spivey, Tanner Dunn, Tatum Dunn, Tillie Dunn, Connar Cornett, Cohen Cornett and Paislynn Hoskins, as well as, extended family Dennis & Glenda Mills and their sons, Darren, Trent & Justin and James Edwards. In lieu of flowers, the Grissett family requests that memorial donations be made to Traditions Hospice, 600 E. Loop 304, Crockett, Texas 75835. To send flowers or a remembrance gift to the family of James Ray Grissett, Sr., please visit our Tribute Store. "Email Address" would like to share the life celebration of James Ray Grissett, Sr.. Click on the "link" to go to share a favorite memory or leave a condolence message for the family.